Sorli the Builder is a Nord citizen residing in Stonehills with her husband Pactur, and son Sirgar. She and Pactur co-manage Rockwallow Mine — and are seemingly the heads of the community in Stonehills too — on behalf of the mine's proprietor, Bryling, who is one of the thanes in Solitude. Bryling also charges Sorli and Pactur with shipping the ore to her in Solitude, although they've recently been having problems on that front. While Pactur supervises the mine, Sorli stays inside her house, and can be found cooking, eating, or taking a nap. She sleeps from 11pm to 7am. Sorli wears a belted tunic along with a pair of boots. She wields an iron dagger and carries a spare belted tunic, a key to her house, and a selection of common items and gold. She will talk about her job: "Pactur and I, we make sure the miners aren't stealing, and that the ore makes it to Solitude." She will also attempt to discourage you from staying in Stonehills, saying, "Nothing here but the mine. Probably best you keep moving." or "We've got all the miners we need, so I hope you're not here looking for work." If the Stormcloaks are successful in their conquest of Hjaalmarch, Sorli the Builder will become the new Jarl, move into Highmoon Hall in Morthal, and take over any quests previously given by the exiled Idgrod Ravencrone. One of her workers from Stonehills, Teeba-Ei, will become her housecarl and Pactur will become her steward, though only Teeba-Ei will follow her to Morthal due to a bug, unless the Hearthfire add-on is installed. She and Pactur will leave their son Sirgar in charge in Stonehills. You can choose to report to her about the wizard Falion's suspicious activities. Sorli will ask for your elaboration: "I've never trusted him... what has he done?" Changing your mind will have her tell you, "Either this is some kind of a joke, or you're keeping something from me. Whichever it is, I don't like it." If you instead explain what Falion has done, she will say, "Is that so? Well, I'll make sure that's taken care of immediately. It's good that you brought this to my attention." After this, she will confront Falion, although sometimes a bug will have her stalk him permanently instead. As Jarl of Hjaalmarch, Sorli evidently isn't any more popular than Idgrod Ravencrone. The citizenry, while divided on the new regime, are at best indifferent, and at worst, hostile to their new Jarl. Falion, for example, will say that "The changes in Morthal are of little consequence to me. So long as the laws are upheld, I do not care who does the upholding." 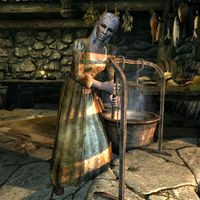 Jorgen the mill owner thinks differently of Sorli: "We've gone from a Jarl lost in her own head to a Jarl that cares for nothing but herself. Lot of good that does us." He will also say "The world's going mad, and our Jarl doesn't care. She's only in it for herself. If she's the best Ulfric has to offer, maybe we might've been better off with the Imperials." His accusations aren't without merit, as Sorli herself will reveal: "Hjaalmarch isn't much, but it's a good start. I'll make a name for myself here, then maybe work my way up to someplace like Riften." Despite thinking little of Hjaalmarch, Sorli clearly thinks she deserves her new title: "Finally, my leadership is being recognized." Pactur seems to agree: "It's good that Sorli has finally been given some real authority." Despite his supportive tone, Pactur clearly remains mindful of the problems facing Sorli's regime: "I'll see to it that Sorli is safe now that she's running Morthal." If Morthal is given to the Stormcloaks in Season Unending and subsequently retaken by the Imperial Legion, Idgrod Ravencrone, her family, and her advisors will return from exile. Sorli, Teeba-Ei, and Pactur will not be exiled, but will return to Stonehills and their previous routines, and will dislike you as if they had been exiled. Sorli is the only Jarl to originate from outside their respective hold capital, and is also the only one who doesn't explicitly favor either side of the civil war. Despite being a Jarl appointed by the Stormcloaks, Sorli worships the Eight Divines, rather than the Nine Divines. This page was last modified on 16 April 2019, at 23:16.